Last month’s Millennium basketball state 5A championship game doubleheader was a fairly rare feat. But it does not seem like a one-off. Fresh off its first state title, the Tigers girls will return three starters for 2019-20. Two of them, center Ali Zelaya and guard Jasmine Singleton, are juniors who played for three years with, and learned from, the seniors that spearheaded the championship victory over Gilbert. “Our seniors are amazing. I’ve been playing basketball with them in club and school. They’ve showed me the type of team culture we want to have, the type of leadership and the positive energy. They’re always picking people up. I think Jasmine and I are going to pick up on those things for next year. It’s our job now,” Zelaya said. Conversely, the even younger Millennium boys program will carry the memory of a bitter 38-37 loss to Gilbert in the Feb. 25 final. The Tigers started three sophomores and two juniors. Senior guard Cameron Wilder was the only rotation player that will graduate. A pair of sophomores from central casting — a point guard who can score while getting his teammates involved and a lean 6-9 big man with three-point range and elite shot blocking — DaRon Holmes (19.3 point, 10.7 rebounds and 4.2 block per game) and Justus Jackson (15.3 points and 5.8 assists per game) were the primary reasons for the program’s accelerated growth from a 6A the previous year. But Amundsen also worked several role players into the mix, many of whom shined in a 72-61 semifinal dismantling of Apollo. Junior guard Michael Batchelor and sophomore guard Coleman Fields help with the defense and raising the tempo, while junior Jalan Early gives Millennium basketball another athletic forward to complement Holmes. Junior guards Zach Foster and Jose Cortes add three-point range off the bench. And all of them will learn from the frustrating final. “That championship feel is different. 3-24 from the three-point line didn’t help,” Amundsen said. The presence of veterans of the 6A in final in 2017 helped the younger players in the girls program with preparing for the playoff atmosphere. But the Tigers’ point guard, freshman Trayanna Crisp, took to the big stage naturally. 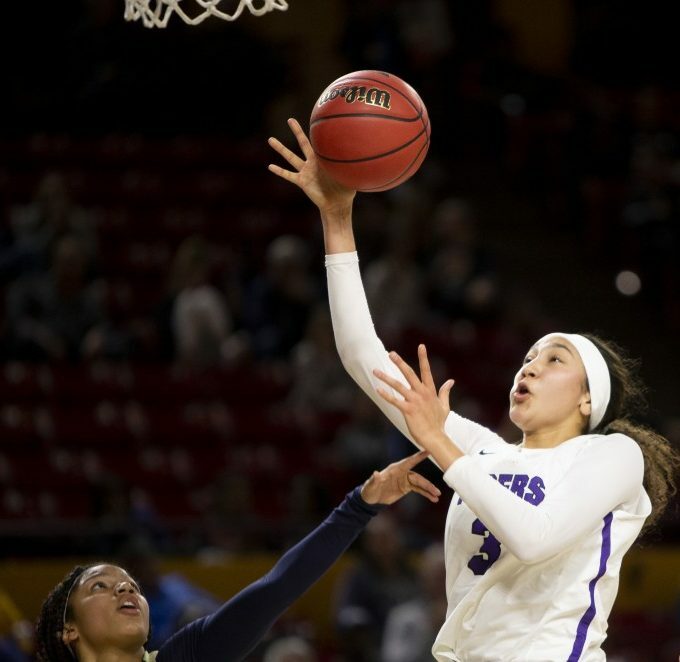 She scored 11 points in the 66-40 finals rout of Gilbert, including two straight third-quarter threes that built the Tigers’ lead to double digits. “It’s definitely a higher intensity. It’s very different — the level of competition and pace,” Crisp said. Millennium girls coach Courtland Rojeck said he’s no longer surprised by how unfazed his star freshman is. As a sophomore, she figures to pair with Zelaya as the team’s primary offensive forces. Zelaya, a 6-3 post player who also hit two three-pointers in the final, has college offers from Arizona, Colorado, Michigan and UNLV. She took over the second half of the title game, pouring in 18 of her 21 points and grabbing eight of her 10 rebounds after the break. She is already talking like a captain, and will be the Tigers main offensive focal point as Dominique Phillips starts her career at the University of Nevada. “Our approach is going to be that we’ve got to earn it. Nothing is ever given. We’ll be more confident because we know we can actually do it,” Zelaya said. Rojeck agreed. His young team fell to Valley Vista in the 6A finals in 2017. The next year he noticed a difference in how the rival Monsoon carried themselves on the court. Beyond Crisp, Singleton and Zelaya, the program will return a pair of guards who played roles in the playoff run. Kylie Grant is a defensive specialist while sophomore Amoret Maxwell provided scoring in a crowded group of reserves. 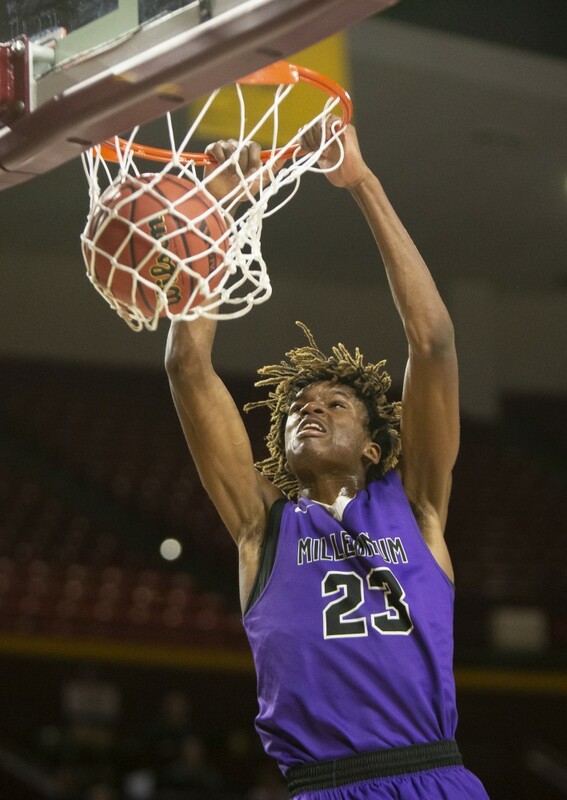 With Gilbert losing the transcendent Cavinder twins, Millennium basketball should enter 2019-20 as a solid favorite to repeat. “We plan on doing this again next year. Maybe, we can even be better,” Crisp said. Millennium’s boys team also will have a target on its back. Gilbert and Apollo were senior-dominated teams. 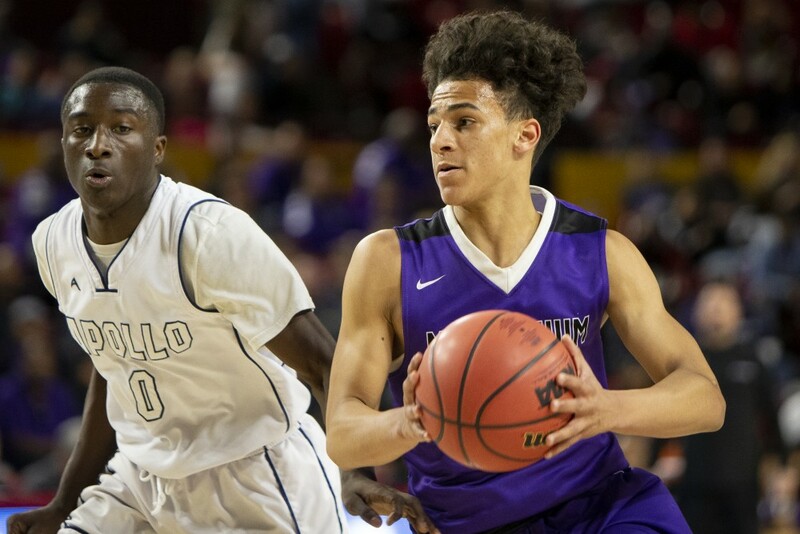 Only Ironwood returns anywhere close to Millennium basketball’s firepower among 5A contenders. The Tigers also are more than a young starting five. Given those sentiments, the boys basketball team cannot wait to get started on another title drive. Rojeck, actually, can. His wife, Jocelyn, gave birth to the couple’s fourth child in January. “I’m looking forward to spending the entire spring with my wife and kids,” Rojeck said.